I love this item. It is made well and is just what the picture shows. the only thing is it comes very small. I usually wear a size large so I ordered an extra large. IN the end I needed the 2X. Nevertheless, I am pleased with the item. I spent a lot of time researching for this vest, and here it was. It fits great and everyone is impressed. Will buy again. I really appreciate the timeliness from your shop in getting different size hat mailed back! Thank you very much for your efforts! These suspenders are good quality, they do the job and look super authentic. My only complaint is that the silver "buckles" that hold them up are a little on the small side to deal with. Obviously they worked, but if you have trouble fumbling with small buckles these may not be the ones for you. (the elastic tail is a must!). Wow... What can I say. The quality, the feel, the look. These pants were great all the way around. They are extremely comfortable, they feel more durable than any of the "normal" jeans I own! I would recommend these to anyone! They do come very long (on purpose) so be prepared to hem or have them hemmed. Great bargain! Great product! The vest is very nice. Fits well and looks very good. Very fast delivery and item was as shown! It fell apart after first putting it on the day before my friend's wedding. I ordered a size larger than what I needed in case something like this were to happen. The dress itself is gorgeous, but seriously, I only wore it for 2 hours and everything went to pieces? Not. Cool. I'm not buying from y'all again, and advise others to stay away as well (for at least this particular item). Editor's Note - We apologize for the manufacturing defect and have issued a credit to the customer. This scarf is definitely WHITE and is no doubt wool, but I sure wish it were a few (six-eight) inches longer. Heck, I'd even pay more for it! It's so hard to find brown ascots and this one is wonderful! THANK YOU. This coat was exactly what I expected.... Looks just like a 1920's Train Conductors coat. Well made, and it fit perfectly to go over my vest. 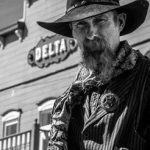 I changed out the buttons to the V&T Railroad buttons and was ready for the Polar Express rides as one of the conductors of the Virginia Truckee Railroad out of Virginia City, Nevada. AND, the price was great! I can't imagine a better made coat for the prices of the other sack coats on line. Thanks! I am very happy with the design and look of this holster. It exceeds my exspectations for a on-line purchase. I will be doing more shopping with this company.Delivery was very fast and I am very satisfied with the Quality and and the way it was so easy to get the right belt size, It was very simply stated and easy to understand when I made the purchace. I purchased this vest to be worn alone, without a suit jacket. It is too warm, here in Los Angeles to comfortably wear a vest and jacket indoors together. The vest itself is of good quality. However, the two lapels are sewn to the back, as opposed to the standard method of the two lapels being one piece of a continuous collar that is seen from the back. This is made to be worn with a jacket, that would hide the back, and disguise the two lapels as one continuous lapel. This would work very well as a costume, where close inspection of such details will not happen. This will not stop me from ordering another item if it fits my needs. As I mentioned before, the vest is of good quality. I will be very careful the next time to look at all the pictures more carefully. I will be returning the vest for a refund. I look forward to doing business with you in the future. received holster and very disappointed with the cheap buckle (cant be seen on the website) and more upset that when I tried it on and then took it off, my hands and clothes had "black" dye on them from the leather being still wet or done in such a way that the color will rub off. I expect a full refund for my disappointing experience. Editor's Note: We have refunded the payment to the customer. We apologize for the inconvenience. Excellent waist coat! and Outstanding customer service. This was another wonderful purchase! This vest is becoming my go to daily vest. The color goes with denim as well as dress trousers, the weight is such to give me confidence to tackle any project with no fear of damaging the garment. I highly recommend this well made garment. The added benefit of the smile you get from the fun lining makes this an almost perfect experience. I bought this vest to bridge the gap between a jacket or a sweater. After looking at vests at other retail options I was pleased with the price for what appeared to be an excellent garment. I have not been disappointed, the weight and quality construction makes this an excellent value. I worried the different types materials would compromise the warmth this vest could provide, I had nothing to be concerned about. This is a real looker, I am complimented almost every time I wear this vest. Wool is soft with a tight weave that wears great. The Pros: great quality coat for the price! The fabric feels and looks realistic for battle and camp use. Not too fancy but a very nice coat. Liner is realistic, too. I really liked the design and concept of this, and for the price, it can't be beat. The Cons: the fit and the buttons. It is incredibly slim-fitting, except for the shoulders which are very oversized. Basically, you'd better be in battle-shape to wear this: like a 22 year-old Marine with arms like pipes and no body fat. I tried a size above what I wear and it was too small around the waist and gargantuan in the shoulder. It wouldn't be worth it to take it to a tailor: too expensive. The buttons are difficult to work and feel insubstantial. It would be easy to replace them with something you prefer. I ordered this as a gift for someone and wasn't sure what the quality would be, fit, etc. I was totally amazed! If I could give this product 10 stars, I would. The blouse is simply stunning and the picture does not really do it justice. It is well made, true to size and fit the gift recipient perfectly. When you hold it, look at, wear it, you feel like you have a true antique in your hands -- it's that beautiful. Thank you so much and I'm adding Historical Emporium to my "favorite" Favorites! These are exactly what I was looking for in a classic trouser. Good quality material and stitching, perfect for any costume or just to wear on a daily basis. Very comfortable to wear. The braces are a must as well. This was my first purchase here. I found the style I wanted easily and they have an excellent guide for sizing. The quality of the hatis top notch, I wore it inside and outside. I did not have a plastic cover over the felt and still had no problems with the hat. The shape and color both stayed true the hat band and ribbon on the brim are just as good. A very useful item.My friends have started admiring the item already. Fit and style are great. Leather is a little stiff but workable. Looks fantastic. This coat is fantastic. The quality of construction and material is top notch and it is exactly as it appears on the site. It goes very well indeed with the homburg (my suggestion, btw ;) I've gotten numerous compliments on the coat and wear it almost daily. It's very warm and cozy! I have used Historical Emporium in the past. I have always received "Excellent Service". This time was no exception. The catalog descriptions of the items ordered are superb, eliminating any doubt as to what you are ordering. As promised, the item was shipped and received "on time", thanks to their easily to use shipping/tracking system. The item I ordered (Coachman hat) is exactly what I was looking for to complete my outfit. I will continue to recommend and used Historical Emporium for all my needs! The vest is of superb quality and fit, just as expected. Needed adjustments to fit correctly. Nice vest; nice work. Fits perfectly, very nice workmanship. Good style fast delivery, and got what i expected. Nice product and shipped in a timely manner.